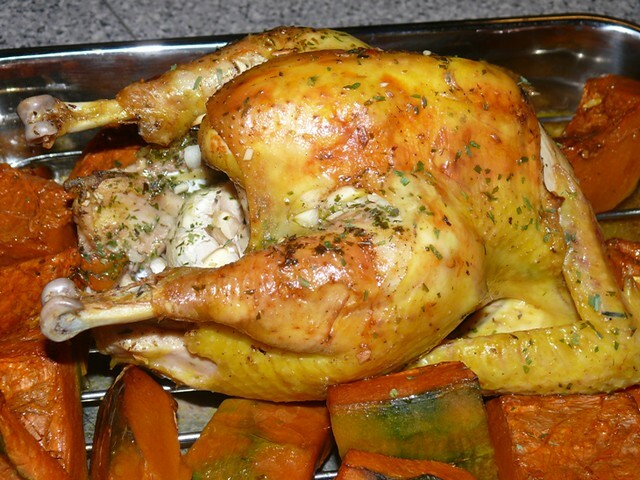 Roasted chicken with garlic and pumpkin. A very health-conscious Vero has removed a large piece of the skin. I was at Lido market this afternoon and heard two ladies talking about one of the ladies' daughter. "Oh, she's back and looks great, so slim? Nothing to eat in Australia??" Two things struck me about that. First, that being slim is so sought after. When I was young(er), everybody was thin and wanted curves. With this generation, everybody's struggling to loose weight. Second, the annual migration of kids who study in Australia back to KK has begun. I think, although I have no stats to back my claim, that Sabah has the highest number of students studying overseas, proportionate to the population. Sabah also has a long history of kids studying overseas due to the fact that there were no universities in the state until 15 years ago when Universiti Malaysia Sabah was established. While having ladies' tea at a friend's house a couple of years ago, 13 out of 14 ladies eating their finger sandwiches had children studying in Australia. Most of the children of my older friends have taken up Australian residence, making Sabah the state with the highest rate of brain drain, I think. While other states have been developed with the oil revenue from this state, the amount of money the federal government pumps back into Sabah is peanuts. Sabah was the richest state in Malaysia 40 years ago. Now it's the poorest state, according to a recent World Bank report. Of course, typically, the state's Economic Planning Unit came out to refute the report the next day. The EPU thinks that along with being poor, Sabahans are stupid too because they think we buy their reasoning that poverty rate being reduced to 16.4 % in 2007 (it's 2010, guys, and the rate has probably gone up) and gross monthly income having increased from RM2503 in 2004 to RM3102 in 2009 makes the state not the poorest in the country. Their statement makes them not only look like the part they are playing--the govenment's goon body--but also appear extremely incompetent because income and poverty rates are only meaningful when compared to the rates in other states. So what if income has gone up by 40% if it is the lowest among the states? How do es Sabah's gross monthly income compare with other states? What about the poverty rate? There are no big companies to work for, no new enterprises. That's why our educated young people aren't coming back. But I'm not getting into politics today; it's a nice rainy, cool evening and I want to enjoy it. Anyway, my point is, I love this time of the year when drinking places and restaurants fill up with the kids back from their studies. Homes are lively again. Like mine is, because Ming got home last night. We brought an excited Ming to the Lido night stalls for ikan bakar (grilled fish on banana leaves) and sotong kangkong (cuttlefish with water spinach) and it was just great, the four of us. The family is still not whole because jiejie is not back yet. We felt it, especially me. 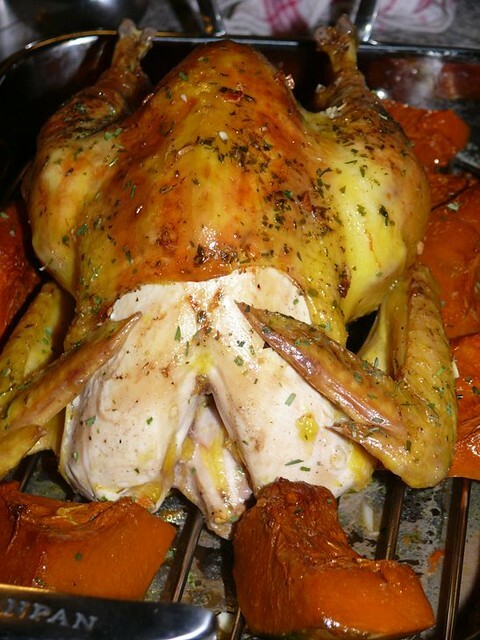 I saw this recipe in Heather's blog and thought it was the classic French roasted chicken with 40 cloves of garlic. It wasn't exactly that, which was good because garlic has gone up to RM10/USD3.3 per kg. I like my baked chickens well baked, with legs that shake loosely when you jerk them. If you like them less tender or if you don't have the time, bake at 220 C for 45 minutes as Heather had done. My chicken tonight wasn't exactly successful because I had set the oven temperature at 190 C (because we went out for a long walk) but got home earlier than expected because it started to rain. The bulb of garlic was not soft enough to be used as a spread, so next time I do this, I'll break the garlic up and scatter it around the pumpkin pieces. I saved the butter for the bread and used just a small cube of it to glaze the skin of the chicken halfway through cooking. This is a great one-meal dish. Or do what I did and serve the chicken with a soup, some greens and crusty bread to mop up the juices. 1. Set oven at 200 C. Season the pumpkin with the EVOO, 1/2 the chopped garlic, a good pinch of salt and some pepper. Put on a roasting rack over a roasting pan. You can also put directing into the pan if you don't mind the oil from the chicken. 2. Rub the chicken with salt, pepper and herbs if using. Stuff the remaining garlic under the skin and in the cavity. Tie the legs if you like them tidy. Place chicken in the centre of the pan, add 1/2 cup of water or stock (so that the juices won't dry up and burn) and put pan into centre of oven. 3. Baste chicken with the melted butter and juices once in a while. If the breast is browning too quickly, put a small piece of foil over it. Bake chicken one and a half hours. (note: If you put your chicken on a rack, you can't baste the chicken with the juices.) Check if the legs can easily be shaken. If so, chicken's done. terri, politicized poultry, one of my favorites! i use my mother's recipe. do you carve the chicken, reserve the carcass and freeze the bones until you have enough of them to make a robust roasted chicken stock? 4 or 5 chickens is a good start. also throw in the garlic husks, any fresh herbs and bay leaves you may have stuffed into the bird if you have them. roasted bones will also add a sheen to your stock that boosts the appearance of any clear soup or gravy/sauce you may make with it. looks so much better than mine!!! lg: i made soup out of the carcass and leftover pumpkin. ah, the raft sounds better than the rack. it was hard to baste using a rack. "politicized poultry" lol, u got my trick. heather: your mandarin is better than mine--no idea what you mean. u are too kind, i think ur bird looks more yummy. it's so plump! malaymui: do a soup! fry some onions, add the pumpkin, a ,large pinch of cardamon, chicken or veg stock. boil until pumpkin is soft, whizz with a hand-held blender, season with s & p, add some cream if like or scoop into bowl, add cream, just make a swirl, don't stir.